One of the nice things about The CW filming all of its superhero shows in the same city (and mostly the same lot) is that every so often, actors can get a crossover adventure on the way to work. Such is the case today. 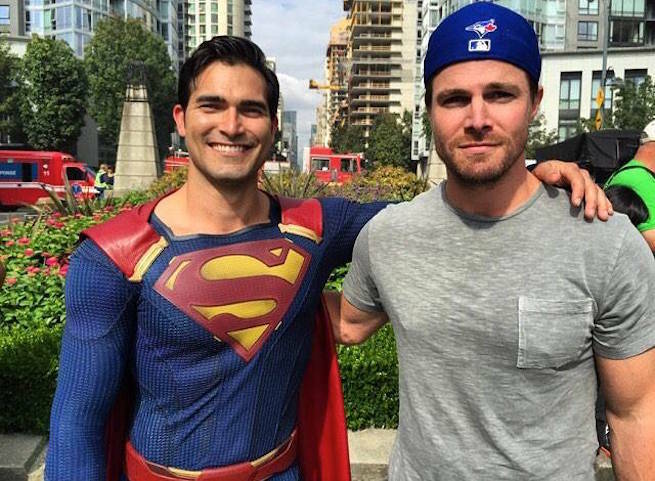 Late last night, Amell took to Instagram to share a photo of himself with Tyler Hoechlin -- taken while Hoechlin was in full Superman costume for production on the first couple of episodes of Supergirl. Unfortunately for all, Amell wasn't in wardrobe as the Green Arrow yet -- but if he was, it's likely he couldn't have released a photo like this without everyone scrambling to the conclusion that Oliver Queen was making the trip to Metropolis (not Naitonal City -- only because those ambulances certainly seem to be the same ones from set photos tweeted out yesterday). In its second season, Supergirl moves from CBS to The CW, and production heads to Vancouver. One of the highest-rated and most buzzed-about episodes of Supergirl this year was its crossover with The Flash. A move to The CW will mean an increase in crossover opportunities with the DC Universe set up at the network. Supergirl shares executive producers Schecter, Greg Berlanti and Andrew Kreisberg with Arrow, The Flash, and DC's Legends of Tomorrow. A four-way crossover has already been promised for the coming broadcast season. Besides Hoechlin, Chris Woods joins the series in an as-yet-unidentified role from the comics, and Ian Gomez will play Snapper Carr. Supergirl will air on Mondays at 8 p.m. ET/PT on The CW starting on October 10. Arrow returns the week before, on Wednesday, October 5, and will air Wednesdays at 8 p.m. ET/PT on The CW.